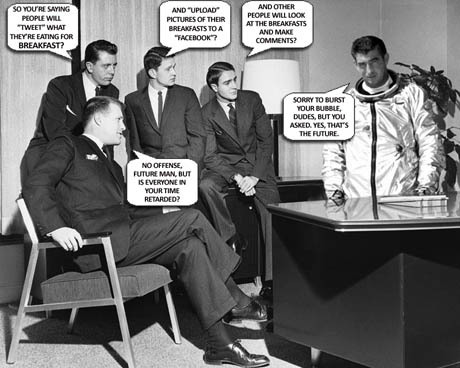 IMAGE: Comic created by the ad blog Where’s My Jetpack? Twitter’s defenders have developed a range of responses to the breakfast argument. Many protest that it’s all about who you follow, and that breaking news, political protest, and broader conversations mean that Twitter is so much more than the occasional cornflake mention. According to this line of thinking, breakfast tweets are like email chain letters: a minor inconvenience that is easily outweighed by the service’s benefits. IMAGE: Jace Clayton accompanied by Poland Spring mineral water at Postopolis! in New York (photo by Nicola Twilley). But the king of the breakfast tweet — the person who has taken the tired cliché and turned it into an artform — is none other than Jace Clayton, a.k.a. 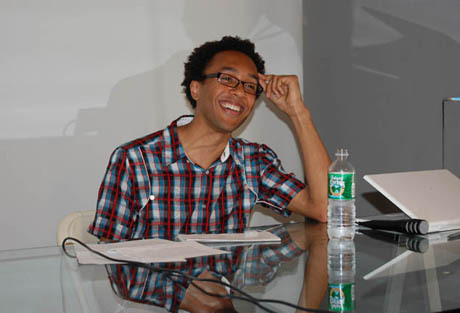 the fantastic DJ /rupture. 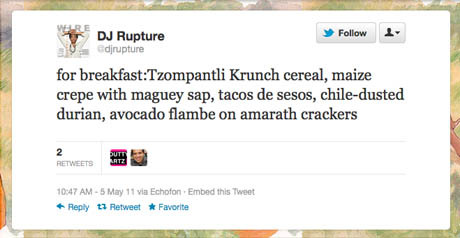 Every couple of months, in amongst news of his forthcoming gigs, book club updates, and observations from his travels around the globe, Clayton riffs on breakfast, with exotic menus that include everything from avocado flambé on amarath crackers to Marmite spread atop pumpkin injera. 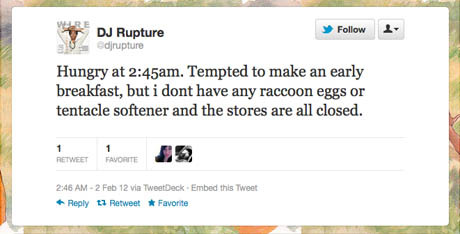 IMAGE: Breakfast, May 5, 2010. For breakfast: pan-seared mercury tuna, 2 poached puffin eggs, freeze-dried walnut ice cream, smoked hickory cheerios with honey, cold soup. 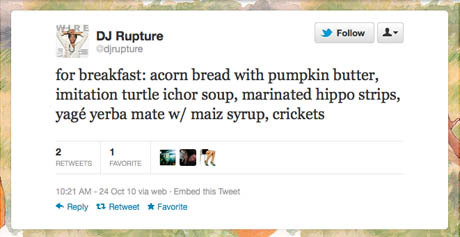 IMAGE: Breakfast, October 24, 2010. 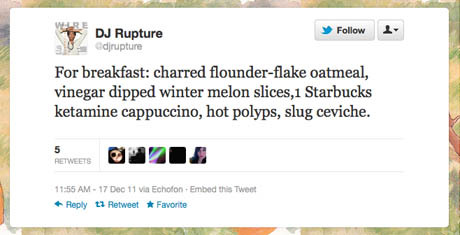 IMAGE: Breakfast, December 24, 2011. 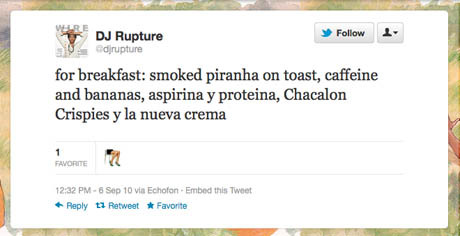 In the course of more than three years of public breakfasting, Clayton has name-checked most of my favourite food ideas: bush meat, imitation foods, alternative proteins such as insects and snails, atmospheric terroir (the “smog-flavored cashews”), and the consumption of invasive species (“kudzu & blood orange salad”). For breakfast: gulf oyster ceviche, ketamine puffs, 1 ripe guayaba (mashed), blue corn tortilla with oaxacan cheese, smog-flavored cashews. For breakfast: shrimp & grits, chlorinated sun-brewed iced tea, ferret sausages, kudzu & blood orange salad, extra garlic, hot sauce. For breakfast: sweet potato pie (extra helpings), hibiscus rosewater lemonade, simple sugar, Katnip Krunch cereal, imitation dogmeat seitan. IMAGE: Breakfast, December 17, 2011. 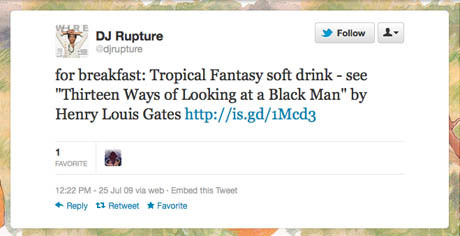 IMAGE: Breakfast, July 25 2009. IMAGE: Breakfast, September 6, 2010. The other breakfasts I have been able to mine from Twitter’s amnesiac records and an earlier list put together by a Portland, Oregon, newspaper are listed below, as an aid to indigestion. They include perhaps the most essential item in Clayton’s breakfast repertoire: the breath mint, which thankfully follows a cilantro-kimchi smoothie. For breakfast: caldo de camarones, Tang horchata, peanut butter huarache, 1 rice krispie treat, chili-dipped grapefruit slices, meat. For breakfast: roast chestnuts, white chocolate, cilantro-kimchi smoothie, 1 slice of deepdish pizza w extra salt, prune juice, breath mint. IMAGE: Nearly breakfast, February 2, 2012. So what does Clayton actually have for breakfast? Thanks to the indiscretion of his wife, artist Rocio Rodriguez Salceda, I am able to tell you what Twitter cannot: soy milk and muesli. Everyday, without fail. What a lovingly researched, genre bending post! Thank you! I will have to see if Whole Foods is now stocking “non-psychic octopus ceviche”!